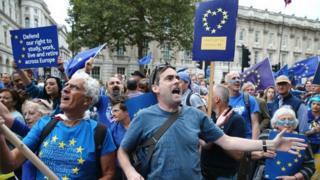 Thousands of pro-Europe protesters have been marching in London, calling for the UK to strengthen its ties to the continent following the Brexit vote. The March for Europe aimed to put pressure on the government to delay activating the formal process of leaving the EU. Pro-Brexit demonstrators staged a counter-protest at one location along the marching route. Rallies have taken place across the UK, including in Edinburgh and Birmingham. A sea of blue EU flags filled Parliament square shortly after 13:00 BST, where protesters sang along to The Beatles' hit Hey Jude, replacing the title words instead with "EU". Demonstrators were calling for the government to make tight economic, cultural, and social ties with the rest of Europe. Armed with homemade banners and flags, campaigners marched from Hyde Park and through Whitehall to the Houses of Parliament, where a debate on whether a second EU referendum should take place will be held on Monday. An online petition garnered more than four million signatures after the vote to leave the EU in June, but an official government response to the campaign said the Brexit decision "must be respected". Politicians including Labour's Chuka Umunna and Caroline Lucas, the co-leader of the Green Party, backed the march along with comedian Eddie Izzard. A man was wrestled to the floor by police after snatching Mr Izzard's trademark pink beret when grappling with him in the street. Mr Izzard pursued the man and retrieved his beret. A man was later arrested. The comedian said: "There was one guy... he went up and snatched my beret - which has a British flag and an EU flag on - and he marched off, he stole it." Mr Izzard said the police "did fantastic, there was an inspector, some other officers in there, they took him down". "I got my beret back, but it's gone off as evidence - my beret is now in evidence," he said, adding: "I'm out, transgender for 31 years and if anyone steals my pink beret, I'll get it back." The Met Police said a 26-year-old man "from a group of around four men who attempted to demonstrate against the march" had been arrested. Simultaneous protests also took place in Edinburgh, Birmingham, Oxford, Cambridge and Bristol. How has the economy fared since the Brexit vote?